This is the first time I've shared a nonfiction book for this feature, but this sounds fascinating! The research sounds so in-depth and I'm excited to see how it all comes together. This is a story that I have seen so many authors try to tell, but I am beginning to think for me at least, a non-fic story might actually keep me engrossed more than a fic one will. Novels have just not done it for me with this story. Sometimes the real story is crazy enough, you don't need added twists or dramatization! oh this sounds soo good. I am for anything lizzie bordon. I must add this to my tbr. I am obsessed with Lizzie and already have an arc. Gotta get this read scheduled. Let me know if you need a list of Lizzie retellings. I've read a few! I thought you would enjoy this one! Hope you love the ARC! This sounds like my kind of nonfiction book. Thanks for letting us know about it! I'm very curious about this one. An in-depth book about Lizzie Borden. I think I'll note this one down because it might be quite good. I'm also really intrigued by this one! I love how in-depth the research sounds, I'll definitely be checking it out if I have a chance. Great pick! I have to read this! I am adding this to my wish list right now. 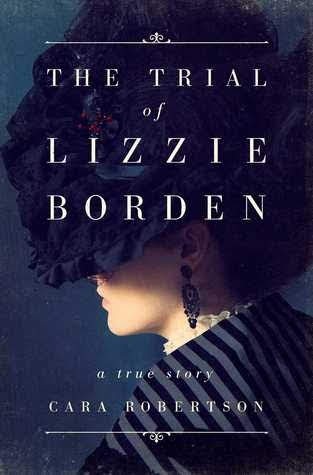 I don't read a lot of nonfiction, but Lizzie Borden (and history in general) interests me. I hope it is a good one! Thank you for bringing it to my attention. I have an ARC copy of this one. I am looking forward to reading it soon. It sounds fascinating. I read this one, Angela- it was so good! I hope you enjoy it too! That's great to hear, Jennifer, thank you! This does sound good. I've seen a few dramatizations but haven't read any nonfiction examinations of this! Our fascination with Borden is amazing. If I had to dabble in non-fiction, this is a pretty good story to start with. This sounds so good! If I decide to read any nonfiction this year, I think this book would definitely make my list. Oh this sounds interesting!!! Ill have to keep an eye out for this maybe in audio! There is something so morbid about Lizzy but something that I can't help but want to read. I too want to grab this one. I hope we both love it and that their is new research yes!